Auch (Gascon: Aush or Aux) is a commune in southwestern France, in the region of Midi-Pyrénées. It is the prefecture (capital) of the Gers department. It is also the capital of 4 cantons: Auch-Nord-Est, Auch-Nord-Ouest, Auch-Sud-Est-Seissan and Auch-Sud-Ouest. 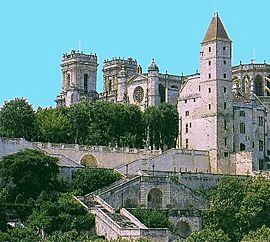 Auch is the historical capital of Gascony and the people of this city are known, in French, as auscitain (women: auscitaines). Auch is an ancient town. 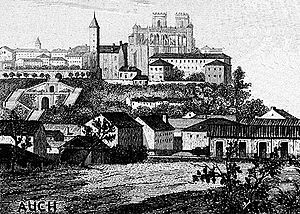 The name of Auch comes from the people that inhabited the area at the time of the Roman conquest. The name of this tribe was Ausci, singular Auscus. The Romans named the town where that tribe lived as Augusta Auscorum (or Augusta Ausciorum), which means "Augusta of the Ausci". Eventually, Augusta was dropped, and the name changed into modern Gascon Aush, and modern French Auch. 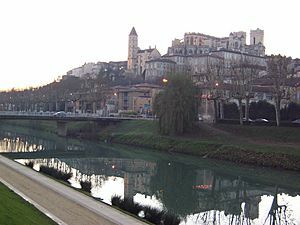 Auch is in the southwest of France, in Armagnac (Gascony), in the valley of the Gers river. It extends along the sides of the river that gives its name to the department. The Upper Town (French: Haute-Ville), on a small hill on the right side of the river. 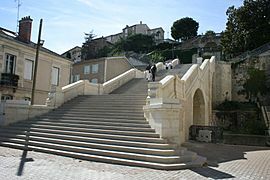 It is a medieval city with narrow streets with stairs and where most of the old monuments are found. The Lower Town (French: Basse-Ville), on a plain on the left side of the river. The commune is, in straight line, at 75 km (47 mi) from the Pyrenees, 150 km (93 mi) from the Bay of Biscay, 160 km (99 mi) from Bordeaux, 70 km (43 mi) from Toulouse and 85 km (53 mi) from Pau. It has an area of 72.48 km2 (27.98 sq mi) and its average altitude is 166 m (545 ft). It has a population in 2012 of 21,960; its population density is of 303.0 inhabitants/km2. 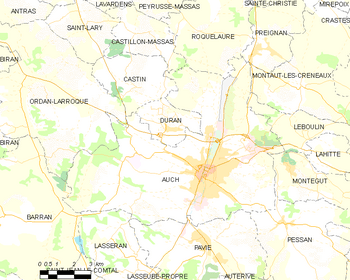 Auch is surrounded by the following communes, all of them part of the arrondissement of Auch: Roquelaure to the north, Preignan and Montaut-les-Créneaux to the northeast, Leboulin and Montégut to the east, Pessan to the southeast, Pavie to the south, Lasséran and Barran to the southwest, Ordan-Larroque and Duran to the west and Castin and Castillon-Massas to the northwest. The climate of the department is an oceanic climate with template summers, Cfb (Marine West Coast Climate) in the Köppen climate classification. The average temperature for the year in Auch is 13.4 °C (56.1 °F). The warmest month, on average, is July with an average temperature of 21.6 °C (70.9 °F). The coolest month on average is January, with an average temperature of 5.9 °C (42.6 °F). The highest recorded temperature in Auch is 40.9 °C (105.6 °F), which was recorded in August. The lowest recorded temperature in Auch is −20 °C (−4 °F), which was recorded in January. The average amount of precipitation for the year in Auch is 690.9 mm (27.2 in). The month with the most precipitation on average is May with 83.8 mm (3.3 in) of precipitation. The month with the least precipitation on average is February with an average of 30.5 mm (1.2 in). 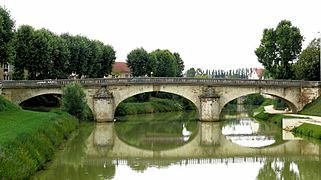 A city founded by the Romans, Auch had its period of power during the Middle Ages, when it was the capital of the old province of Gascony. The high quality of the limestone is an important component of its monuments and buildings, such as its cathedral. Cathédrale Sainte-Marie d'Auch (St Mary's Cathedral). This cathedral took 200 years to build; from the 15th – 17th centuries. Hôtel de ville (City hall). Auch Facts for Kids. Kiddle Encyclopedia.